For something lighter this week, our daughter presented me this grid of squares with the comment, “Layout is all about visualizing, right? This looks like a good exercise for that.” And I’m like, okay, I think you’re right. Layout handles both real and phantom interactions between objects, shapes, colors, and other elements in a structure, in positive and negative spaces. The better you can visualize the interactions, the better your designs will be. So the question is, how many squares do you see? Answer next post. This entry was posted in Design, Gestalt. Bookmark the permalink. 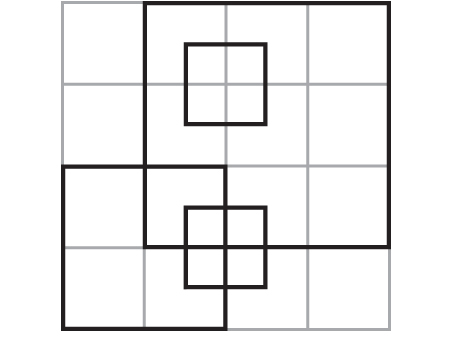 150 Responses to How many squares? I found 40, but that’s before my morning coffee. Are there more? I love to use grids in my designs, both visible and invisible. Yup . . . I count 54 too. how did you get 54? Not sure how many I see, but I think there are 38 as it’s laid out. There are at least 36 squares that can be constructed from the lines shown; more are possible if one imagines the extension of lines that terminate within the field. You can get 40 without imagining any. If we’re meant to answer, my answer is 40. 40 . . . ? That’s just mean. I found 41 but may have missed some. How did you get 41? Actually, I counted again and got 50. You need to count all separate small boxes, all medium, the large, the sum of each and the ones that are like the outlined one in the lower left. Feels a little like the site I’m working on right now! 36. I got up to 40, and after realizing that the dark outlined squares are hints for seeing other potential ways to view more squares, I thought maybe I should count them again! Does the answer include all the squares or just the black ones? I count 9 black squares and 29 grey+black squares. Do you mean how many BLACK squares do you see? I see 9. Actually, no, there are more black+grey squares. Counting all the combinations, there are 43 squares. I see 30 squares . . .
29 squares, which includes all interactions between black and grey lines and the overall square outline of the shape. The first time I did this I counted 40 squares — hasn’t changed since. This a really fun exercise. I counted 30 squares. I think I counted 9 squares. It’s an interesting exercise, for sure. how did you get 49? I think if you have over 40 squares, you should link to your sketches here. I would love to know! I see 42. Let’s just assume that it’s a friendly little sign from the ghost of Douglas Adams. Oops, I missed one. I see 40 now. I shared this on my Facebook page awhile ago and everyone loves counting ’em — it has been my most popular post! Um, on earth, 40 + 9 + 1 = 50, not 42. Plus, I don’t see any grey square only (no black lines). Very confusing. Great exercise. I counted 40 squares. 40 sounds right to me as well. I counted about 40 too. At first I saw, 27. Now I get 35, but the comments indicate there are more. Maybe a little lunch will trigger a different response. I see 40 squares. I love visual puzzles! Actually, I love all types of puzzles . . . Andrew’s post is quite clever. Design, for me, is like solving all types of puzzles such as visual, word play, logic, lateral thinking, and of course jigsaw puzzles. I count 41. How many did I miss? Thank you for showing the answer and not just throwing out a number! Thanks! I could only see 36 until you posted this breakdown — then I realized which four 2x2s I’d missed. 30 squares altogether, overall, I think. I count 36 black and grey squares. 9 if I consider only the black squares . Yep, I count 50 too. I stopped counting after 33 with the gray boxes . . . attention deficit. Most comfortable with the dark lines and the clean rows of boxes. Started getting annoying after realizing the gray boxes can be grouped together for more boxes. I count 40 squares — nice puzzle! I found 40 including gray and black lines . . . I thought 39, but my partner mentioned the overall outline is also a square, so I think it’s 40. 30 are drawn or showing. If changing the drawing and adding to — the number will go up. I think there are 42. Are you removing the grid from this question? I you want to count the whole display area, then 10, which would have been my answer unless . . . If you want to count the grid, add 25 to get 35. If you want to count the grid interactions with the black objects, add then add 5 more for 40. I see 4 total . . . one large, one medium, and two small. I count 41 . . . unless it’s a trick and some of them aren’t square! No, I take that back . . . 40! I got 40 as well. I see and count 40. Did you count the two squares forming the borders around the mini squares that are off-grid? I continue to get 29 and am really curious about how others are seeing more than that. There are 9 using only the black lines, and 40 if you use all of them. 40. Had to look a number of times and kept seeing more. Those little ones got me! Huh. I only see 29. Wow, did I miss some? Designed like quilt blocks using all renditions of square, square in square, I found 40 — and then designed a quilt! I got 40 . . .
At first glance, I “see” four. If I actually count, I find 40. Well, on first glance I see 4 accented squares. I did not count them. I’ve seen this on Facebook some time ago. I counted 40 too. I can see more, but my brain is weary to count them all. The number of squares I feel is about 6. The two large ones . . .
Their intersections . . . The two smaller, central ones . . . I could add more detail, but I guess the exercise is about perception, and my eyes tend to ignore the grey squares as unimportant and see the blacks as more so. The interaction of squares also creates a “tension” that makes them stand out. I come up to 34. I got 40 as well. I was going to say 39, but I almost forgot to include the large square on the outer border. Wait ’til you ask, “how many rectangles are there?” and see people tripping over the squares-are-rectangles argument. I count at least 66, including imaginary squares missing one or two lines. It is difficult at first and depends on the rules applied. Which squares am I missing to go over 40? Thank you for showing us your answer and not just throwing out a number! Black line squares are nine. If we add the grid lines, the total is 57 squares. Don’t forget the grid squares forming at the middle. But since this is not an applied math forum, I think we are missing the point of the question here. From subjective point of view all answers are correct, because to you as a viewer all that matters is how many squares can YOU see. At first glance I saw only 4 with black outline. After a while I noticed the intersection of two big squares forming the 5th square same size as the small ones. To me, that is a 16-square grid, but it can be a 64-square grid with the underlying half-square grid. In fact, a 64-square grid would make the layouts interesting. First time I counted I got 25. Then recounted and got 42. I get 40 squares. I get a lot more rectangles, but I don’t see 54 squares. I admit I went a little square crazy — way beyond those outlined in black and gray. I envisioned a lot more than what is actually there. In my mind’s eye, I could see squares within squares within squares within squares within squares . . . until they got too small for me to see or count. Color markers helped. But I stopped “seeing” at 1,378. Is it square to just sum up the squares? If the question is: How many squares do you see? It doesn’t matter what colour they are. In that case I count 40 squares. You need to have eyes for the initial question, otherwise you can get sidetracked. Still can’t see more than 40 and certainly not 50+. Perhaps the definition of SQUARE is coming into question? “Square” as in four EVEN-sided elements? LOL! All those counting over 40 are seriously over-counting or doing something wrong — there are only 40! You asked how many squares we see. All totaled, light grey and black, I see 30 SQUARES, of them 9 black squares. Oh, but now I’m thinking about a few more combinations, or did I count those already? I’ve lost track, again! And the winner is 48.
. . . or all are losers, and 40 is the winner. It’s looking beyond the obvious. With each square being counted, I said, oh yes, another one I didn’t see. This is a great “eye training” exercise. There are a total of 30 squares in a 4 x 4 grid. I got 44 after confirming four times.